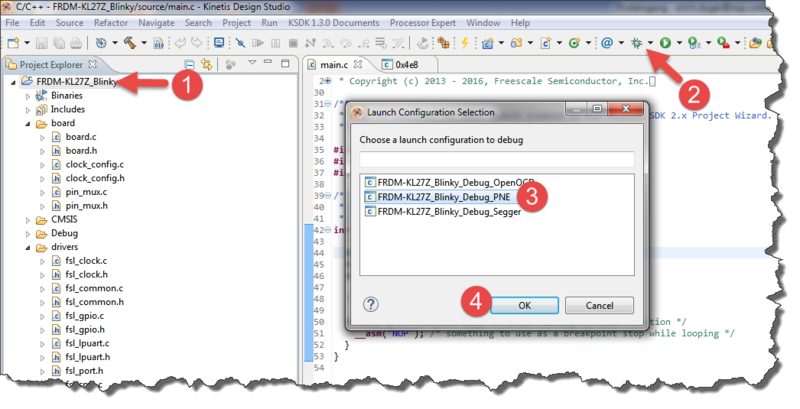 Getting started from the beginning with this ARM-based embedded processor, using Kinetis in Eclipse. Compared to the KL25Z, the KL27Z board has only half of the flash size (64 KByte instead of 128 KByte), but runs at same frequency (48 MHz ARM Cortex M0+) and has same amount of SRAM (16 KByte). But it does have two push buttons which I miss on the FRDM-KL25Z. 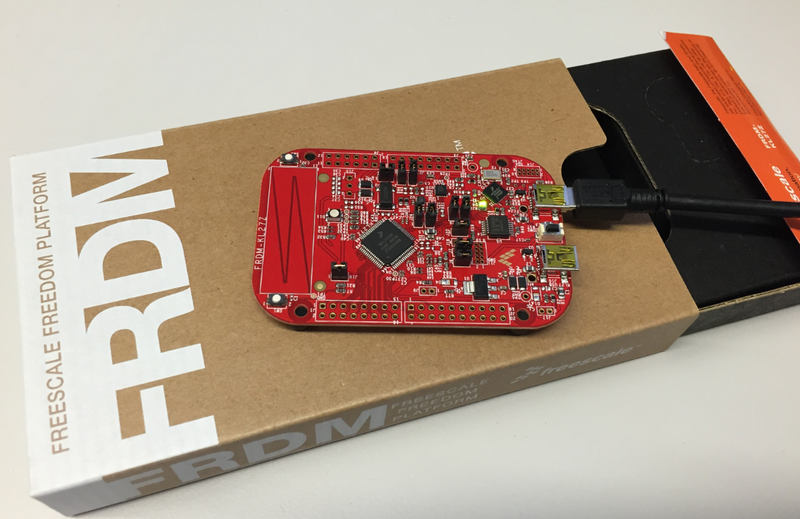 The FRDM-KL25Z is sold for CHF 14.82 by Farnell, and the FRDM-KL27Z costs CHF 20.07! So this is a big price increase. But I kind of like that board as it comes with the jumpers populated and is one of the newer Kinetis devices with bootloader and crystal-less USB operations. 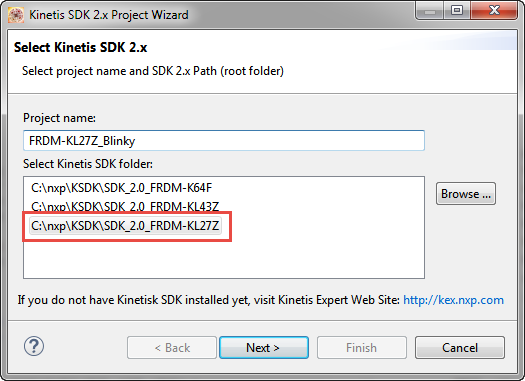 The KL27Z is supported by the new Kinetis SDK v2, but that SDK does not include Processor Expert :-(. 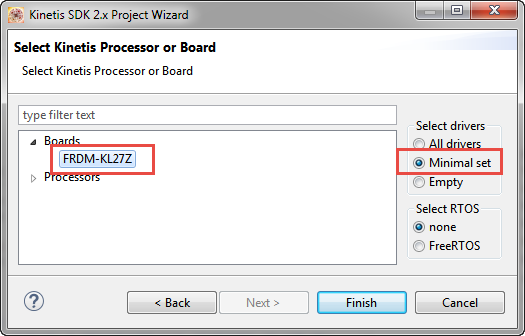 Porting existing KL25Z applications to the KL27Z is easy: one of the main advantages of Processor Expert is that it makes porting from one microcontroller to another one a matter of a few mouse-clicks. 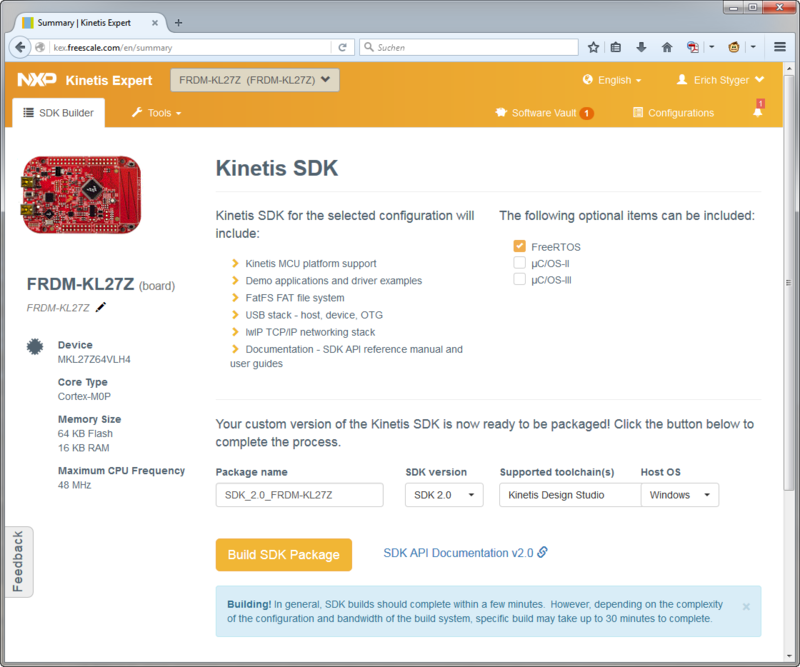 Note: The KL27Z is supported by the Kinetis SDK v1.3 which *does* include SDK Processor Expert components. But these components are incompatible with any previous non-SDK components, and I rather want to be on the latest SDK which is v2.0 now. Porting later things from v1.3 to v2.0 would be time-consuming, as the API between the SDKs are very different (or better to say: completely incompatible). On the plus side, the SDK v2.0 is easier to use, so I want to go with that one and not spending time on the v1.3. 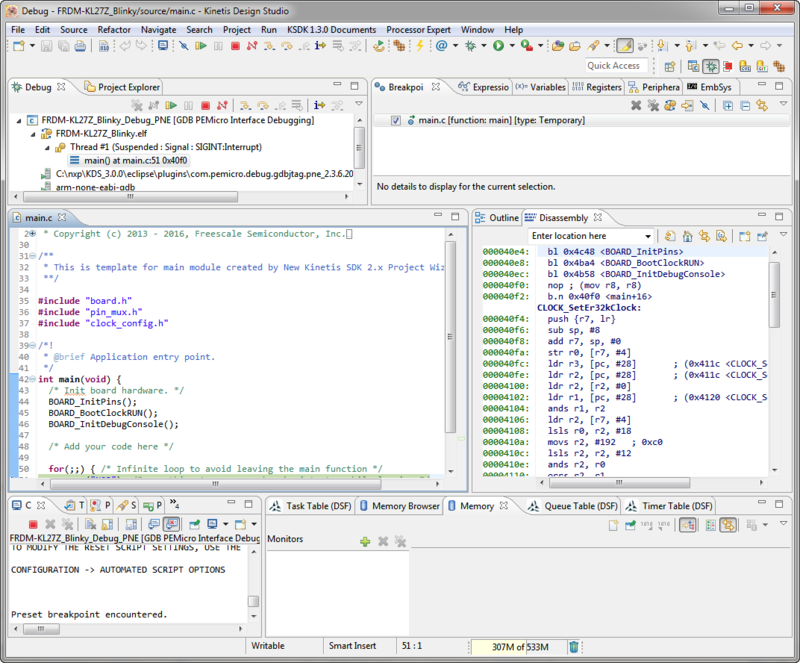 This post is about the usual starting points for embedded projects: blink an LED :-) As IDE I’m using Eclipse Luna in Kinetis Design Studio V3.1.0. Note: The FRDM-KL27Z comes with the P&E OpenSDA firmware loaded by default. Enable the clocks for Port A and B. Without the peripheral clocked, it will not work or even will create a fault when I try to use it. Mux the pins. Every pin can be routed (or muxed) to different ports. Configure the pins. This configures the pin for the specified operation (e.g. input or output). Later I can use the pins in the application e.g. to turn the LED on or off. The first entry in the struct configures the pin as output pin, and the second entry is the initialization value. As the LEDs are connected with the cathode side to the microcontroller pin, writing a ‘1’ (logical high) will have the LED turned off. With above functions I can put the pin either low, high or toggle it. The first parameter is a pointer to the port, followed by a bitmask for the pin (or multiple pins if they are on the same port). Note: I have marked the parameter with ‘volatile’ to prevent compiler optimization, otherwise the compiler generate very fast code for that delay function. I kind of like the FRDM-KL27Z board which is supported by the SDK v2. But the SDK v2.0 does not come with Processor Expert which makes porting all the existing projects to the board difficult and time-consuming. And the price of the board is much higher (CHF 20) than the FRDM-KL25Z (CHF 15). I like the two push buttons and the pre-installed jumpers, but that’s a big price add-on with for half of the FLASH memory. And the FRDM-KL25Z is currently better supported by software and tools. So while I kind a like the board, I’m not sure if I should switch to that board. Students have to pay more if they want to keep the board, they have to learn the new SDK v2 (easier than SDK v1.3, but still more time), and they will be slower and less productive than before with using Processor Expert. 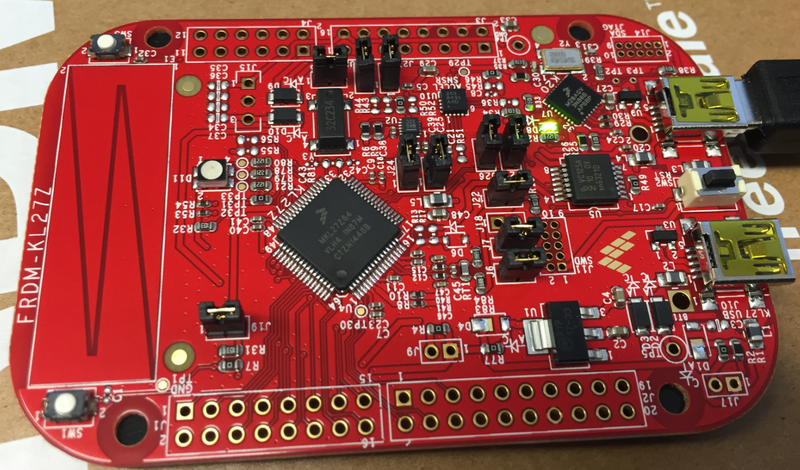 With Processor Expert it is a matter of minutes to run a blinky LED application on a brand new board. As someone said: “faster than you can eat a slice of pizza”). Now bigger slices of pizza or needed? Sounds more like to change the type of of lunch? Not sure what will be healthier ;-). On the bright side, the SDK v2 is much cleaner and easier to use compared to SDK v1.3. Using the SDK v1.3 was not reasonable before, now the SDK v2 could be considered. What I’m thinking about is that there could be some ways to continue using Processor Expert with the SDK v2: to combine the best of two worlds? Maybe worth to explore? The project created in this tutorial is available on GitHub here.